Sen. Bernie Sanders (I-Vt.) is a person I prefer never to talk about, especially online, but this time I’m making an exception. It appears that no matter what he does wrong, many people, especially “Bernie bros,” have been making excuses for him since we were first introduced to the senator in 2015. It’s almost as if Sanders’ promise of tuition-free college through the primaries was based on how quickly progressives defended his positions, no matter how contradictory those views were becoming. What Sanders has continued to teach me, among other things, is that white saviors will not (and cannot) save a single black person in the U.S. or around the world. Unlike many other young black millennials, I never got a tingling sensation when Sanders announced his presidential candidacy two years ago. To be clear, it was hard to ever believe that a then-73-year-old white, cisgender, straight man would ever lead a revolution, especially one that protects and defends marginalized communities—including poor people, LGBTQ individuals, black and brown women, and undocumented folks. It always surprised me when people went so hard for him, as if his role wouldn’t ultimately have been president of the United States, a position from which revolution is impossible by design. But lately it’s come to my attention that Sanders’ idea of a revolution was disingenuous at best and pandering at worst. Recently, Sanders endorsed Democratic Omaha mayoral candidate Heath Mello in his bid to oust Republican incumbent Jean Stothert as leader of the largest city in Nebraska. He’s since stood by his decision to support the candidate, even though Mello’s abortion record is questionable and has rightly drawn criticism. Many Democrats, myself included, were outraged over Sanders’ support, despite his noting that such a strategy was one of the few ways the Democrats could take back all 50 states. This has me wondering: What, ultimately, is the difference between Democrats and Republicans if we’re both focused on gutting fundamental beliefs merely for political convenience? The person not to ask is Sanders because he’s neither Democrat nor Republican—or he’s both. At this rate, who knows? Mello has some confusing and, at times, contradictory views on reproductive health care that are indeed rooted in his personal anti-choice, Catholic values. On some occasions, he has sided with Planned Parenthood as chair of the state Legislature’s budget committee. But, and perhaps more important, he has also previously co-sponsored a bill requiring physicians performing abortions to tell a woman that an ultrasound is available. Although it wan’t mandatory that the ultrasound be performed, as the Wall Street Journal and the Washington Post have reported—which is an important technicality—we know that any similar language serves the purpose of impeding reproductive rights, namely abortion access. In addition, the 2009 bill required abortion providers to position the screen in such a way that it made the ultrasound easily viewable—you know, just in case the pregnant woman wanted to see the fetus inside her? In 2010, Mello voted to ban abortions after 20 weeks, and the next year, he voted to bar health exchanges set up under President Barack Obama’s Affordable Care Act from funding abortion. He has also voted to change a young person’s “parental notification” requirement to “parental consent,” regardless of what we know about the violence that young women who become pregnant often face. This is all important, and not in the ways that many of us may realize. I have never been a single-issue voter, but there are certainly issues that matter more than others. One such issue is access to comprehensive sexual and reproductive health and choice, including access to safe and legal abortions and contraception. To be sure, anti-choice rhetoric is merely a conduit to attacking women and other communities’ bodily autonomy and integrity in other ways. Voting against choice is rarely, if ever, about choice. If we want to see how friendly or hostile policymakers are to people, watch how the policymaker treats the most marginalized, and watch if he or she supports people who behave the same way. We already knew that the Trump administration would attack women and girls (see “global gag rule” reinstatement and expansion), but is this where we have arrived? If the options are between supporting a dangerously conservative candidate and a Democratic one with anti-choice values, I’ll take neither. Since his defense of Mello, I’ve heard many Sanders supporters (who can’t seem to let go) swear that he’s simply attempting to find a way to win in a red state, and that elected officials don’t have to agree with us 100 percent of the time on each issue because that would create a party divide. That’s interesting, considering what Sanders’ initial appeal was: He was seen as someone unconventional, a person who didn’t appear to be bought out by the wealthy elite. Demanding a revolution is inherently divisive because it calls for ensuring that those without power get it. 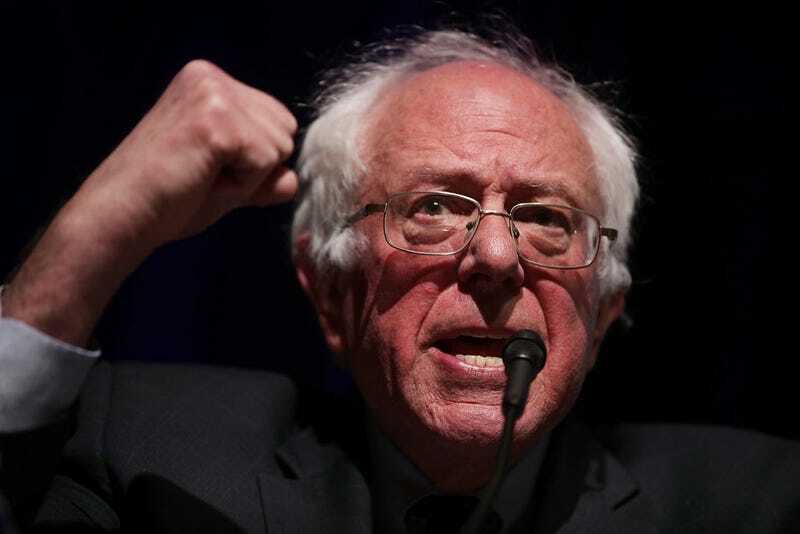 It’s hypocritical for Sanders to demand a revolution—something outside of the status quo—and then go back to “business as usual” for political expediency. Our history is becoming shorter-lived. If we’re being honest, the Democrats are throwing Mello under the bus; after all, it isn’t as if we haven’t supported candidates with nontraditional Democratic principles before. It doesn’t surprise me that Democratic National Committee Chair and former U.S. Dept. of Labor Secretary Tom Perez has found a target in Mello and is now using him to play Russian roulette. What does surprise me, however, is who is leading the charge in support of Mello: Sanders, a candidate who mobilized people to rally around economic justice. Sanders never had me fooled. He has always had a suspect understanding of economic justice anyhow—one that mistook race for being about economics only. That very idea causes an already pervasive white privilege to spill all over the place. But now we know that not only does he have an idea of race as not being a very real factor, but he also has weak gender analysis, despite claiming to espouse empowerment. If we want to talk about economic justice, we must talk about how it intersects with reproductive justice. Economic security is interconnected with reproductive justice because people need economic, social and political resources to make healthy decisions about their own bodies—decisions like seeking a provider for an abortion and related care. This is where Sanders’ support of Mello is perhaps most disappointing. A person cannot be for economic justice if he or she is either anti-choice or supports a candidate who is; they are mutually exclusive. During the election cycle, I made a personal commitment to vote in my reality—that is, one without nondischargeable student loans, canceled consent decrees, a gutted Department of Justice and eroded human rights. Let’s be clear: My position on Sanders has nothing to do with Hillary Clinton, for several reasons, the main one being that she, too, lost. Though our gut reaction is to mention her even in relation to matters that are solely about Sanders, I repeat: This is not about her. Not only did Clinton never promise revolution—indeed, much of her history spoke otherwise—she promised good governance. And that’s an altogether different conversation from this one. Perhaps we’ll eventually see Sanders for the person he is: the same politician he rallied against. One who uses bodies as political compromises, one whose economics will never include gender and race analyses, and one whose idea of a revolution entails supporting an anti-choice candidate because potentially winning is more important than sticking to fundamental values at the core of our humanity. Alas, we’ll continue defending him so that we can get more post offices legislatively created and sponsored by the revolutionary himself.